John McCain: “I don’t understand” Threats to Block Gun Bill Debate … Hmm, I Don’t Understand How this Fool is a Republican? 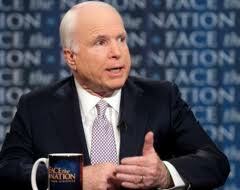 Is Senator John McCain a Republican? Senator John McCain (R-AZ) stated on CBS’s ‘Face the Nation’ that he opposed the filibustering a debate over gun legislation, despite threats of such action by fellow Republican senators. McCain stated, “I don’t understand it. The purpose of the United States Senate is to debate and to vote and to let the people know where we stand.” Probably more to the point is that McCain cannot stand that the GOP Senators that are looking to filibuster the anti-Second Amendment gun legislation is the young gun conservatives Rand Paul of Kentucky, Mike Lee of Utah and Ted Cruz of Texas. Or as McCain refers to them as ‘Wacko Birds’. Honestly, I don’t understand how this guy is a Republican. I certainly never understood how this RINO was nominated to represent the GOP as president in 2008. Had it not been for Sarah Palin on the ticket as VP the beating would have been even worse. Sen. John McCain said Sunday that he opposes the thought of filibustering a debate over gun legislation that will probably be brought to the Senate floor this week, despite threats of such action by fellow Republican senators. A trio of first-term GOP senators–Rand Paul of Kentucky, Mike Lee of Utah and Ted Cruz of Texas–stated in a letter last month that they will block any gun control legislation that they consider a threat to Second Amendment rights. CBS ‘Face the Nation’ transcript. Really, you IDIOT! John McCain is on the wrong side of history, the wrong side of the US Constitution and the wrong side of the Republican party. In essence, one has to wonder why he even runs as a Republican these days? Is McCain not going to stand for the GOP principles of defending the US Constitution and the Bill of Rights? Let’s face it, McCain cannot stand that the party has passed him by and he no longer has any power. It is time for this fossil to hang it up. McCain actually thinks that background checks are going to prevent criminals and those that would inflict harm against others would prevent shootings? Is he that much of a moron? Since when do criminals follow the rules and the law? Back ground checks would not have prevented the Newtown, CT Sandy Hook Elementary School murders, nor other mass killings. All these Progressives are after is a gun registry database. The additional names include Sen. Marco Rubio, R-Florida; Sen. James Inhofe, R-Oklahoma; Sen. Jerry Moran, R-Kansas; Sen. Richard Burr, R-North Carolina, Sen. Ron Johnson, R-Wisconsin; Sen. Mike Enzi, R-Wyoming; Sen. James Risch, R-Idaho; Sen. Mike Crapo, R-Idaho, Sen. Dan Coats, R-Indiana, and Sen. Pat Roberts, R-Kansas. Brought to you from the most transparent and ethical administration ever. The 2008 Barack Obama campaign has been fined $375,000 by the FEC, Federal Election Commission, for reporting violations of campaign donations received during the final days of the campaign. Yes, you read that correctly, 2008!!! As per the FEC, the fines are among the largest ever levied on a presidential campaign. So what took them so long to figure this out and why was this not reported to ‘We the People” prior to the 2012 presidential election? President Barack Obama’s 2008 campaign has been fined $375,000 by the Federal Election Commission for reporting violations related to a set of donations received during the final days of the campaign. The fines are among the largest ever levied on a presidential campaign by the FEC and stem from a series of missing filings for nearly 1,200 contributions totaling nearly $1.9 million. Campaigns are required to file the reports during the final weeks of the campaign. I wonder when we will learn of any 2012 Obama campaign irregularities … 2050? Wonder when the FEC will come down on the 2012 Obama campaign for its online/credit card vulnerabilities and donations from foreign nationals? How do you justify not using CVV on their campaign donation page, yet Obama required it on his online site for Obamawear? Newspapers are a microcosm of the mood swing of American voting sentiment from 2008 to 2012. … But this election is about jobs, the slow economy and Washington’s dysfunction. Our leaders can’t even pass a budget, much less stabilize soaring debt that’s burdening our children and grandchildren. Obama failed to embrace his own commission’s bipartisan debt deal. Ryan, serving on the commission, similarly balked at the solid and comprehensive agreement. This is quite astonishing that so many liberal newspapers have changed their endorsement and gone away from Barack Obama. Team Obama, his minions and the in the tank liberal MSM have touted that Obama was overwhelmingly ahead in his ground game and early voting. NOT SO FAST. Last night Senator Rob Portman (OH-R) spoke with Sean Hannity discussing voting in Ohio and Mitt Romney’s chances of victory. According to latest reports, 230,000 fewer Democrats have voted early in Ohio this year. Also in contrast, 40,000 more Republicans have voted early in Ohio this year. Gallup states that Romney is up by 7 over Obama in early voting. We will only know on election eve who has been telling the truth when it comes voter turnout. Hmm, Gallup reports that, “In U.S., 15% of Registered Voters Have Already Cast Ballots”. That’s not the headline … the following is, Romney leads Obama by 7% in early voting!!! Team Obama, his minions and the in the tank Obama MSM have been spinning for weeks that Barack Obama has the advantage in early voting and that they are way out ahead of Mitt Romney. NOT SO FAST. Just like everything else they spew about Obama, its a myth. According to Gallup, Romney is leading Obama in early voting 52% to 46%. This is an amazing 22 point drop by Obama from 2008. Romney currently leads Obama 52% to 45% among voters who say they have already cast their ballots. However, that is comparable to Romney’s 51% to 46% lead among all likely voters in Gallup’s Oct. 22-28 tracking polling. At the same time, the race is tied at 49% among those who have not yet voted but still intend to vote early, suggesting these voters could cause the race to tighten. However, Romney leads 51% to 45% among the much larger group of voters who plan to vote on Election Day, Nov. 6. The Lonely Conservative has an very interesting factoid, the GOP is way out ahead of absentee ballots over Democrats in Pennsylvanian. In 2008 the GOP edged the Democrats by just 2% in absentee returns. As of today the GOP’s lead is 18.8% — a 16.9% bump in a state Obama won by 10% in 2008. Republicans have turned in 55.2% of the absentee ballots to date while the Democrats have returned just 36.4%. The Romney Victory team has been on the ground in Pennsylvania for months with over 60 staff and dozens of offices. We have made over 5 million volunteer voter contacts including over 1 million volunteer door knocks across Pennsylvania. Let’s be realistic, who really is motivated to vote for another Obama four years? Anyone can plainly see that there is no enthusiasm for Obama in 2012. There is no hysteria for Obama like there was in 2008. Frankly, why should there be. Just as many wanted to vote into office the first black president, many are making sure they vote out a president who has been an epic failure.